The effect of yoga and meditation on consciousness and mindfulness were examined comparing beginners, intermediate, advanced meditators and a group of non-meditators. 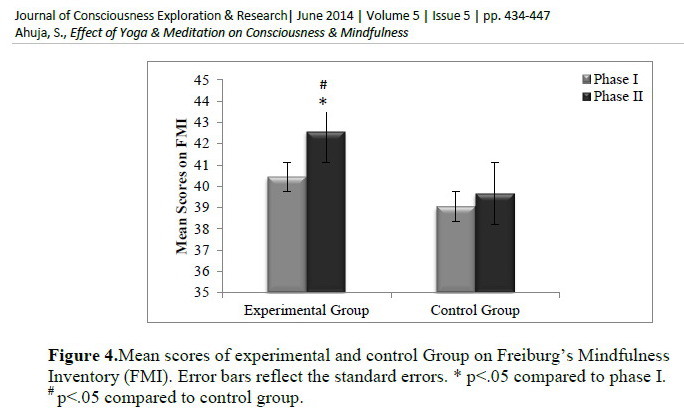 The three experimental groups improved from pre-test to post-test compared to control group, highlighting the benefits of yoga and meditation on consciousness and mindfulness. 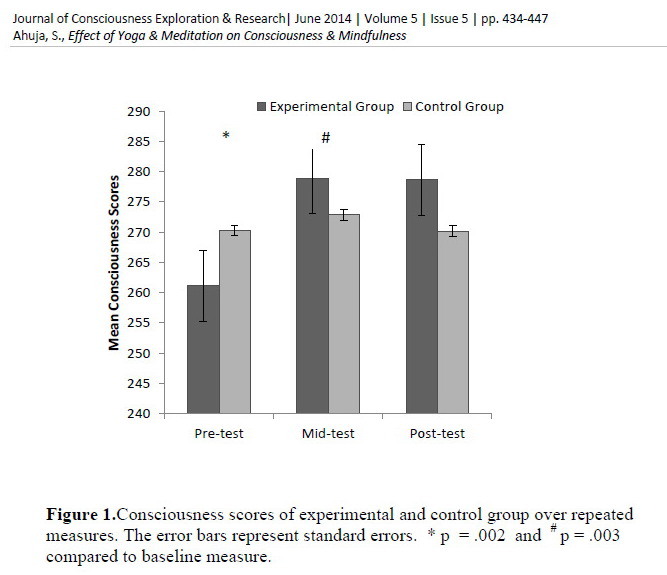 Consciousness of advanced meditators was highest in comparison to other groups at pre-test. Consciousness and mindfulness of beginners increased at a faster rate over time. Further, the effect of intervention was examined on physical, emotional, cognitive, social, spiritual and self-consciousness. Sixty participants took part in the experiment (17 to 70 years). The participants were applicants of yoga and meditation program offered for twenty weeks. Four groups of 20 each were formed including, 3 experimental groups and one control. The groups did not differ with respect to gender (11 males and 9 females in each group). Experimental group had three set of subjects as stratified samples viz., pre-initiates (beginners) – those who were not trained for any meditational practices prior to experiment, first initiates (intermediate meditators) – those who were trained for contemplation of divine form at the seat of spirit(between two eyes), second initiates (advanced meditators) – those who were trained for sound practice which consists in concentrating attention at the seat of the spirit and establishing contact with the current of Sabda or mystic word. The experiment was in the form of practice of yoga and meditation for 20 weeks. The practice sessions (one hour) were held on weekdays in the evening for three days a week under the guidance of experienced practitioner. These were conducted by yoga instructor with 10 years of experience and a facilitator with 30 years of experience in teaching meditation. Each day, the programme commenced with a brief 15 minutes lecture covering different topics to reinforce the subjects for meditation. The topics included body, mind, spirit and consciousness; cosmology; spiritual awakening; nerve centres, chakras, kamals and padmas; attunement with spiritual sounds; main object of meditation and ways to establish contact with the source of spirituality. This was followed by yoga. Seven yogasanas were included in the intervention programme for relaxation Siddhasan, Sarvangasan, Bhujangasan, Paschimottanasan, Padahastasan, Ardhamatsyendrasan and Shavasan. These asanas were selected for relaxation and preparation of body for meditation. After yogasana, the practice of meditation was modeled on practices of oriental philosophy of Saints (Radhasoami Faith). These meditational practices are based on Hierarchical Order Theory of Consciousness. Consciousness Quotient Inventory (CQ-i) and Freiburg Mindfulness Inventory (FMI) were administered in pre-test, mid test and post-test. The experimental group improved from pre-test to mid-test (t=3.400, p=.002, d= 0.55). The improvement in this group was also observed in post-test (t = 3.135, p=.003, d = 0.51) from the baseline measure (Fig. 1). The control group showed no significant difference from initial scores to mid-test measure (t= 0.58, p=.567) and to post-test measure (t=.021, p=.983). 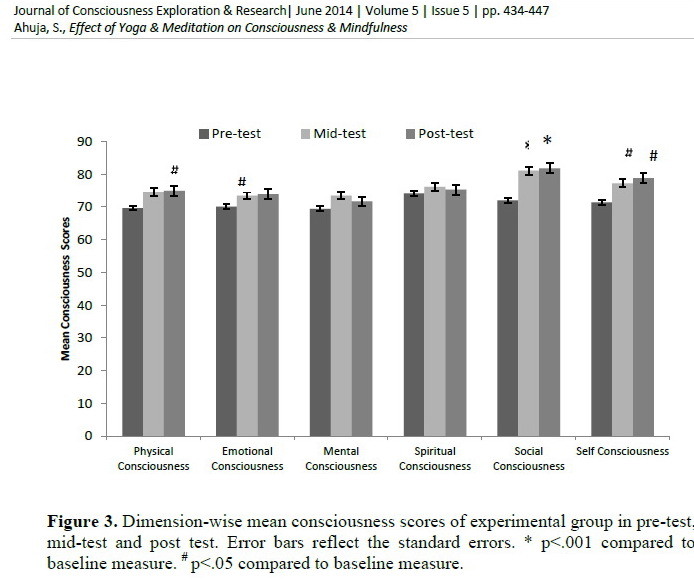 In order to find the change in specific dimension of consciousness as a result of experiment, the scores were analyzed dimension-wise.There is significant increase in consciousness scores for some dimensions from pre-test to post-test (Fig. 2). The difference in mean consciousness score in pre-test and post test is not significant for mental consciousness (t= 0.76, p=.45) and spiritual consciousness (t=0.63, p=.52). There is significant increase in scores of social consciousness (t=3.53, p=.001, r =.73) and self consciousness (t=2.56, p=.015, d = .47) from pretest to mid-test. Also, the difference in scores is significant from pretest to posttest for social consciousness(t=4.56, p=.000, d = .80) and self consciousness (t=3.11, p=.004, d = .61).The difference in pretest and mid-test scores is not significant for physical consciousness (t=1.87, p=.070) and emotional consciousness (t=1.88, p=.070). There is significant gain in the scores of physical consciousness (t=2.28, p=.029, d = .43) and emotional consciousness (t=2.57, p=.015, d = .36) from pre-test to post-test. The analysis of scores on FMI was done in two phases. The first phase was 11 weeks of yoga and meditation practice and second phase was 20 weeks of intervention. The difference in mean scores on FMI of control group in phase I and phase II is not significant (t= 0.72, p=.48). There is significant difference in mindfulness scores of experimental group in Phase I and Phase II (t = 2.41, p=.021, d = 0.35). Fig. 3 reveals that there is effect of experiment on mindfulness (t= 2.16, p =.036, d = 0.59). In summary, the results of the study indicate that the practice of yoga and meditation increased the consciousness and mindfulness of individuals. Importantly, the practice has considerable effect on all dimensions of consciousness over time. The impact is more and relatively immediate on social and self-consciousness. Thus, an individual becomes more aware about self as a person and is able to connect oneself with others. Also, initially after ten weeks of practice, the practitioners did not show significant change in physical and emotional consciousness but there was significant increase in these dimensions of consciousness after 20 weeks of practice of yoga and meditation. Though the difference in mental and spiritual consciousness was not significant even after 20 weeks, but there was increase in these dimensions also. A longer duration of practice may have significant effect on mental and spiritual consciousness. Further, the naive practitioners showed significant gain in consciousness scores after practice of 20 weeks in comparison to those who had exposure to the practice of yoga and meditation. It may be possible that for more gain in consciousness scores, regular practice at length is required. The study highlights that the practice of yoga and meditation is more effective for pre-initiates who are not trained for any meditational practice. The consciousness of experienced practitioners also increased considerably with the regular practice of yoga and meditation. These findings corroborate the results of previous studies that report meditation promotes both physical and mental wellbeing and contributes to the development of positive emotional traits. The regular yoga practice is reported to improve aspects of cognition and quality of life for healthy individuals. The workers reported feeling happier, with a renewed sense of enthusiasm for their life and work after eight weeks of meditation training and practice. Meditation effects are conceptualized as a function of the cognitive-attentional processes that are engaged. Also, in line with the results of present study, it has been reported that experienced meditators generally score higher than novices on most attention measures, including selective, executive and sustained attention. Researchers looking at individuals engaging in Focussed Attention meditation found that expert practitioners with an average of 19,000 practice hours displayed more activation in the brain regions than novices, while those with 44 000 hours of practice showed less. Further, the correlational analysis indicate that high levels of mental, spiritual, social and self-consciousness are correlated to high level of mindfulness. These results support the hypothesis that mindfulness would correlate positively with consciousness. Mindfulness is inherently a state of consciousness. The objective of the study was to examine the effect of yoga and meditation on six dimensions of consciousness of naïve and experienced practitioners in comparison to non-practitioners.The improvement in different dimensions of consciousness showed in this study and effect of yoga and meditation as reported in other researches account for amelioration in cognitive functions and consciousness as a whole. The findings are very optimistic in that meditation practice can alter an individual’s social, self, physical and emotional consciousness setting towards the positive, which may then become default state. Although the further investigation is required separating out the effect of both the practices on consciousness and mindfulness. Note: A previous study showed that an intervention using Contemplative exercises (as designed by Stephen Wolinsky), once a week for 8 weeks don’t produce the necessary impact to increase the CQ of the participants.